ChildYOUTH age: 5-12 years old. 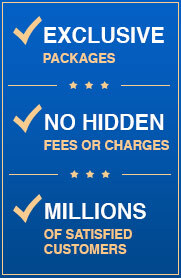 Children 4 and under pay port and security fees. Travel to Fort Myers from Key West, spend 2 fun-filled nights and 3 glorious days exploring Fort Myers, then ferry back to Key West. It's the fastest and most comfortable way to travel to Fort Myers. Remember, "getting there is half the fun!" 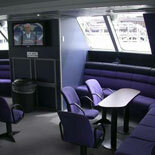 The Key West Ferry is the best way to travel for fun and comfort on the Gulf Coast! Fort Myers might very well be the ideal getaway, with it's white sands, stunning sunsets, a little bit of Eco-friendliness and tons of enthralling beach and recreational activities. It has all the ingredients. Cross the bridge to this refuge of a town and prepare to feel the weight of the world lift from your shoulders, as you enjoy 2 nights and 3 fabulous days here. Fort Myers is the place to be if a little rest and breathing room are in order. While sometimes overshadowed by some of the other nearby resort communities, Fort Myers is a destination that is popular with both families and singles alike. 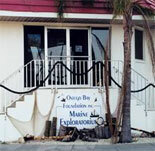 At the Ostego Bay Marine Science Center, visitors to Fort Myers Beach can get up-close-and-personal with marine life, enjoy boating, swimming and other activities at Lover's Key State Recreation Area, or for those feeling lucky, the Big "M" Casino Cruise is a five-and-a-half-hour jaunt with blackjack, roulette, dining and entertainment. Other diversions to look forward to include some of the best beachcombing in Florida, jet skiing, bird watching, shopping, scuba diving and deep-sea fishing. Each person in a given traveling group likely has their own goals for what to see and do (or not do, if this is indeed all about unwinding and relaxing); Fort Myers is ready to take on any and all expectations. It's known for being a well-equipped, yet laid-back spot, offering all that tourists need without the overwhelming crowds and hassles of visiting a busy tourist stop for travelers. Do as little, or as much as you like. Avoid the traffic and travel in comfort to America's Caribbean paradise. Note: Hotel accommodations are NOT included. For places to stay, visit Fort Myers Beach Hotels. Dec 26th- June 5- Runs 7 days a week. Check calendar for special holiday sailings and some closures. Depart Fort Myers Beach 8:30 am / Arrive Key West 12:30 pm. Departs Key West 6:00 pm /Arrives Fort Myers 9:45 pm. Schedule subject to change. Please arrive at least 45 minutes before departure. Does not operate on Easter, Thanksgiving , Christmas Eve and Christmas Day. If going to Key West on Sat or Sun and staying longer than 2 nts please call customer service for assistance in booking. Your booking is a request only. Reservations are only confirmed once an email is received back from Key West Express listing all passengers names and their cross reference confirmation number. 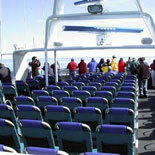 You MUST contact Trusted Tours to confirm all names prior to the booking confirmation being sent by Key West Express. E-Ticket will contain complete details regarding this tour and reservation information for this request. 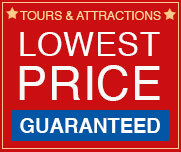 Hotel accommodations are NOT included | Your return date will be confirmed on the third day or an alternate sailing date of your choice | Reservations are required at least 48 hours in advance | All sales are final and tickets are non-refundable, however reservation dates can be changed by calling customer service. Changes to reservation dates will incur a change fee ($25)| Travel time is directly related to prevailing weather/sea conditions | Passenger is permitted to bring no more than two carry-ons aboard the vessel | must arrive a minimum of 45 minutes prior to scheduled departure. All minors under the age of 18 must be accompanied by a paying adult.